To maintain the windows in your home, work place or other property in sparkling clean condition you can use our professional services. 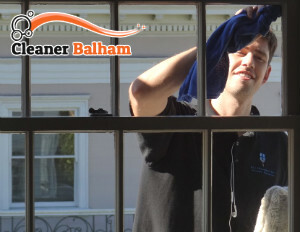 The window cleaning which we provide in the region of Balham SW12 is effective, fast and professional. 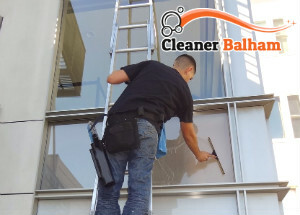 The cleaners who work in our company use modern equipment of supplies and devices that ensure excellent washing, rinsing and sanitising of window sills, glasses and ledges. They work with water fed pole systems that guarantee the privacy of the customer and remove dust, stains, smudges and grime. Use our professional windows cleaning services whenever you need them. Our cleaners work in accordance with the Health and Safety regulations. They wear uniforms, are very discrete, punctual and polite. The cleaning methods and time that will be spent depends on the height of the windows from the ground. Our staff are trained to provide abseiling, use water fed pole systems, cradles and hydraulic platforms to reach very high windows. They work in line with the British requirements for safety that guarantee properly done cleaning without any risks. The window cleaning which we provide in and near Balham is available seven days in the week at reasonable prices. If the windows in your home, office, rented or business property need thorough and well done cleaning, call us. Our window cleaning technicians can remove the smudges, dirt, dust, stains and grime from the window glasses, frames and sills. Get in touch with us to book the window cleaning which you need in or near SW12 and we will prepare you a quote. Applying the most appropriate methods and techniques for sanitising, our staff will make your windows sparkling clean and impeccable. For more information and help get in touch with our call centre that works around the clock.